I received an email last week from a friend who has connections - the email stated that there were rumors floating around about a new runDisney race to take place in Disneyland. 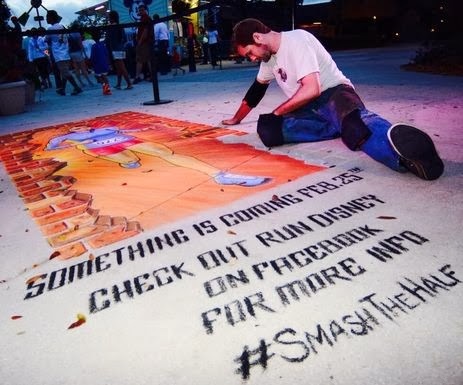 My curiosity peaked and this Sunday, runDisney announced the rumors with chalk art at the Princess Half Marathon Ever After Party. Following the hashtag #smashthehalf, everyone started their own theory's. I instantly thought Smash was referencing the Incredible Hulk and the event would be Marvel Comic related, wishing for an Avengers themed race. While my favorite color is pink and I sometimes have a hard time believing I was not born a princess, deep down inside I am a tomboy and I grew up as a huge fan of the Avengers (I blame my mother). Well my wish came true at 11:35am this morning when runDisney announced the new Avengers Super Heroes Half Marathon Weekend at Disneyland Resort on Twitter, Facebook and on runDisney's blog. The series will take place in Anaheim, CA November 14-16, 2014. It will be a three day race weekend for super heroes of all ages, featuring a half marathon, a 5K and kids races. Along with the races, there will be several family-friendly events such as a Health & Fitness Expo and a pre-race Pasta in the Park Party. The Avengers Half Marathon course will be a new 13.1-mile route through the Disneyland Resort and surrounding areas that will differ from the Tinker Bell and Disneyland half marathon courses. Runners who successfully brave the new Avengers Half Marathon course will receive a commemorative Avengers-themed finishers’ medal. Registration will open on March 25 at www.runDisney.com. It is safe to say this Super Hero-themed race will sell out in record timing, following the trend of the other two Disneyland race weekends. If you are interested in running this event, I strongly encourage you to get runDisney email sign up & notifications via email and place a calender reminder to sign up the first minute registration opens on 3/25. Overall, runDisney race weekends attracted more than 163,900 runners last year – a 40 percent increase over the previous year, making the runDisney series one of the largest in the nation. The Avengers Half Marathon Weekend will be the eighth runDisney event and third at Disneyland Resort, joining the Tinker Bell Half Marathon Weekend (May 7-10, 2015) and the Disneyland Half Marathon Weekend (Aug. 28-31, 2014) at Disneyland Resort. Make sure to follow runDisney on Twitter, Facebook and email sign up. I stated a few days ago that after Princess Weekend, we didn't have a race on the calendar for the remainder of 2014. I decided over the weekend that we would be participating in the Wine Dine Half following our Honeymoon. With the Avengers Half Marathon weekend following Wine Dine, it may look as if we will add a few additional runDisney medals to our collection this fall because the Avengers race is one I will not miss!